Where would you expect to find one of the world’s leading ocean-sailing yacht builders? On Lake Texoma, of course. 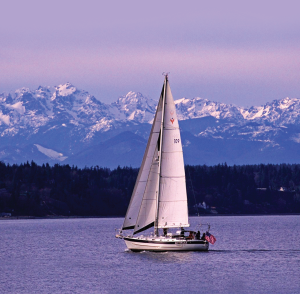 Nathan Rothman of Seattle wanted to imitate Magellan, too, and in the early 70s, he decided the ocean-sailing community needed a new type of ocean-going sailing vessel. He took his idea to a young marine architect named Robert Perry, and the Valiant story began. 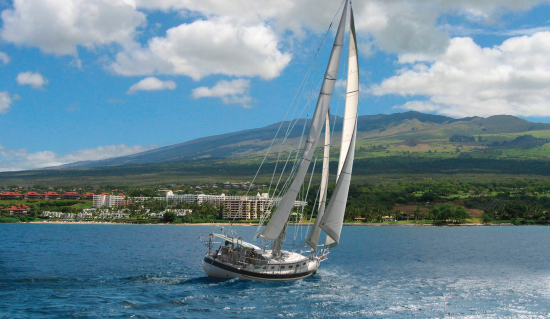 Perry went to work to build a cruising sailboat with traditional lines that a couple could handle easily, but which would provide the level of offshore performance usually associated with racing boats. Perry’s success was the Valiant 40, and a new concept, Performance Cruising Yachts, was born. As Valiant’s reputation spread beyond the Pacific coast, Rich Worstell, a marina owner on Lake Texoma added the Valiant line to his business. Worstell is more than just a seller of boats; he is also a sailor of boats, and in short order he was one of the Valiant’s biggest proponents. When Uniflight, the corporate owner of the yacht builders, put the company up for sale in 1984, Worstell stepped up and bought it. He knew he had a good product, but he was unhappy with the Seattle shipwrights who were actually building the boats, so in 1985, he decided to move the entire operation to the Cedar Mills Marina on Lake Texoma and build the boats himself. “Prior to buying Valiant, we hadn’t built any boats. We were just sailors. We dealt with two other types of boats and did a lot of miles that brought a lot of exposure and experience,” said Worstell. However, Worstell was not without experience. Maybe he hadn’t built boats, but the Missouri native had a strong background in aviation, and just as an airplane must protect its passengers, a sailboat must protect its sailors. He also understood the responsibility that comes with building something that people will depend upon for their very lives. “The two fields run right together, because if you don’t build a boat right people get hurt offshore, and if you don’t build an airplane right people get hurt in the air. We apply the same level of quality control to boats that is used in aviation,” he said. Wiring, plumbing, and cabinets are installed based on the owner’s specifi cations and options ordered. As the years have passed, the Valiants have undergone changes and improvements as technology and materials have developed. The Valiant 47 was a world-renowned cruiser known for its comfort and safety. Valiant 47s made two out of the first three solo, non-stop circumnavigations of the world. Bill Pickney, the first African-American to sail around the world, did one of these circumnavigations on a Valiant. A solo circumnavigation is a non-stop trip around the world made by one man sailing a boat with stops only for refueling. The trip takes about 230 days. Trips such as these and Valiant’s impressive safety record have made Valiant one of the world’s most highly regarded sailboat companies. “We’ve never lost anybody on a Valiant. We’ve had Valiants run over by a freighter in the middle of the night, and the boat was strong enough to hold together until people could get off,” said Worstell. “Our boats are bulletproof,” said Worstell. No, really; they are. When a Valiant in the southern latitudes on a circumnavigation took a bullet through the hull in a suddenly dangerous port, the owners plugged the hole with a rag and sailed 300 miles away to repair the hull in safer surroundings. “The last thing we look at is the price. The first thing we look at is the safety of the boat and the usability,” said Worstell. Seeing as the boats have a $400,000 to $1,000,000 price tag, this is not surprising. The Valiant line has evolved and changed over the years as Worstell and his team have continued to improve the boats and develop new models. Rick Lemon is Valiant Yacht’s National Sales Manager. “When you are selling a sailboat that can cost over a million dollars, there is a certain standard that has to be met,” said Lemon. “There were always hard times, but we learned from those and continued working for a better boat. There was never a time when I regretted what I was doing,” said Worstell. At present Valiant constructs both of the models on the market today at the company’s factory at Cedar Mills Marina. Worstell and his design team have taken their knowledge and new ideas and incorporated them into the two current boats: the Valiant 42 and the Valiant 50. Both boats are semi-custom. 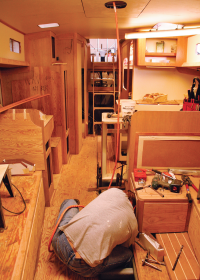 The hull, rigging, hardware and keel are standard on all the boats. However, the consumer can customize the interior and electronics. In the market of mass-produced sailboats and large companies like Catalina and Islander, Worstell is proud of the semi-custom construction of Valiants. “Part of what makes Valiant so special is that it’s a custom boat. Nothing we do is done by machine.” The factory employs 25 people from the Texoma area who assemble the boats by hand. Worstell and his son, Chris, jointly manage the company.